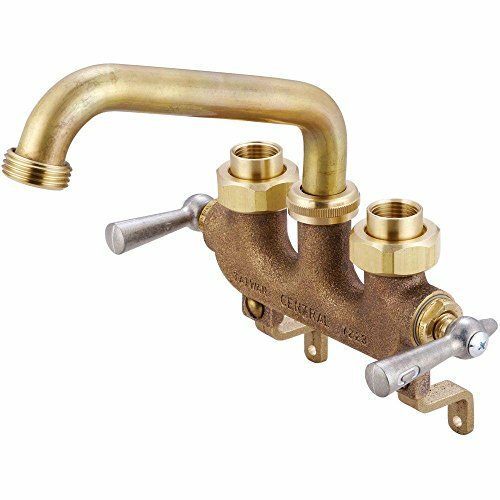 0470 features: -laundry faucet.-Wall mount.-3.5'' centers.-Offset legs.-Female coupling union supply connections.-The stems have a double o-ring seal and rubber seat washer.-The 6'' brass swivel spout has a hose end Adapter.-Ada compliant.-Ansi/nsf standard 61, section 9 for lead.-Asme A112.18.1M listed. Construction: -cast brass construction. Dimensions: -overall dimensions: 6.625'' h x 7.563'' W x 6'' D.
If you have any questions about this product by Central Brass, contact us by completing and submitting the form below. If you are looking for a specif part number, please include it with your message.